He had seen many African Americans move west after the Civil War to escape discrimination. With four other men with similar vision, Allensworth decided to establish a place where African Americans could live and thrive without oppression. On June 30, 1908, they formed the California Colony Home Promoting Association. They selected an area in Tulare County because it was fertile, there was plenty of water, and the land was available and inexpensive. They first bought 20 acres, and later, 80 more. The little town with a big vision grew rapidly forseveral years -- to more than 200 inhabitants, by 1914. That same year Allensworth became a voting precinct and a judicial district. Colonel Allensworth was killed on September 14, 1914, when hit by a motorcycle, while getting off a streetcar in Monrovia. After a funeral at the Second Baptist Church in Los Angeles, he was buried with full military honors. The University of North Carolina at Chapel Hill, through a grant from the National Endowment of the Humanities, has put into electronic format a book written by Charles Alexander about the life of Allen Allensworth. This book was published in 1914 and is included in its entirety (and in searchable format) on the Documenting the American South website. 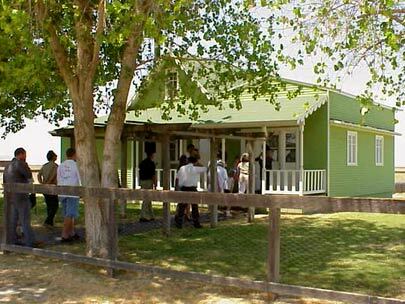 One of the many wonderfully restored buildings you can visit at Colonel Allensworth State Historic Park is the barbershop once owned by Frank Milner. Information about Mr. Milner and the restoration of his barbershop is available here. This HistoryNet.com article by B. Gordon Wheeler discusses the history of Allen Allensworth, the town of Allensworth, and its important place within the larger context of African American struggles for equality and opportunity. Click here for a link to the article.